14 March 2017 by . Father Tomislav: Dearest brothers and sisters, we will continue with our topic “The new man in Christ”. The last time we spoke about “God in the spirit of man”. Today we will speak about “The relationship between spirit and soul”. We are still continuing our path towards the recapitulation of the whole universe in Christ, our battle against the spirit of evil, the spirit of the Antichrist; these times are important because once we are filled with the power of the Holy Spirit we can counter any kind of action of the evil. Father Tomislav: In these days there is much talk of the psyche, psychology, psychotherapy – all good things but psychology, psychotherapy, do not reach that centre. At the centre there is the basic dynamic of every man who stands face to face with God. If you do not find this relationship with God in your spirit, face to face with Him, you cannot immerse all your problems in God, and you cannot get the power that comes from your faith, for the spirit of man is the root of his life. The spirit that opens up completely to the Spirit of God will be filled by the Holy Spirit who imprints a seal on the soul and the soul will be directed towards Jesus Christ and by Jesus Christ it will be directed towards God the Father. If the soul is humble and meek, submitted to God, then the Trinitarian Spirit will act powerfully in the spirit of that soul; in the spirit of the soul the fruit of the Holy Spirit will grow peace, joy and especially faith, hope and charity. Our Lady has taught us that when a soul opens up to the Most Holy Trinity, it becomes like an untouched, fresh flower with all its petals intact; thus Satan cannot take that flower because it belongs to Jesus Christ. What happens at the beginning of our life, at the moment of conception is fundamental. From this we can understand our relationship with God, that is, the relationship of our soul with the spirit. “I create every man in my own image and likeness. I do not create sin, because no evil can come out of me. Every soul is put before a choice, that same choice that your ancestors were faced with. He must choose between good and evil, between light and shadow, between yes and no. Every soul sees me and sees Satan. It chooses freely. According to its choice, the soul sets out in the wake of its ancestors, thus determining its belonging to this or that humanity. It is always the soul that chooses, I do not create sinners. The soul that is faithful to me, that wants to live subjected to my laws, rejects evil and chooses to serve me by means of my Son in the Holy Spirit, consecrating itself to Mary. This soul will be part of one of the faithful humanities that populate the universe. The others will belong to those humanities that are similar to them, and they will set out on their pathway of purification. If they wish to, through a pathway of holiness, they may rectify their initial rebellion and attain communion with me, by virtue of the Sacrifice of my Son”. Father Tomislav: What happens deep inside us, in our most intimate place, at the moment of conception is a mystery, but it is only a mystery from the human point of view. For the children of God who want to live with God the mystery is illuminated; therefore, at the moment of conception the soul is illuminated by a special light and in that very moment and with special grace it can make its choice, however, every soul is already tested there. Why is it tested? Because it is created to be free. Therefore, its freedom must express itself through a direct relationship with God; as has been said, at the moment of conception the soul sees God and Satan. This is not something our physical eyes can see but the spiritual eyes, and from there the fundamental choice is made: the souls who say a clear and powerful yes are strongly directed towards God; those who say a strong no are directed towards Satan and hardly ever turn back. The major part of the souls is in the middle expressing a weak or false yes; they too have to recuperate. St. Raphael says that the spirit of man cannot live without the Spirit of God. In front of this choice, the person who chooses God will be filled with the Spirit of God, but who chooses Satan will move towards Satan who is a creature. God gives the breath of life to everyone so that they may live. This is where the soul chooses the laws according to which it will live, either to God or Satan, while the breath of life remains in each one of us. Thus, if the souls do not choose God, they will rely on Satan, on the spirit of the world, and today they rely on the spirit of the False Prophet, the Antichrist. We will develop this point in the next reflection since it is important for this time. “The crucial point of the trial for every soul at the moment of conception is whether or not to accept Jesus Christ. It is called to choose whether to welcome Jesus and follow Him to the cross so as to then rise up with him, thus participating in the work of redemption in favour of the whole universe, or not. Here Satan comes into play; he tempts man from the beginning, with flattery and threats. God allows this, so that the soul might come to know the reality of good and evil as they are. It sees Satan as it sees God. Life and death lie before it and it must choose. This is a decision that God asks every man to make, without exception. When the soul welcomes Jesus Christ, it receives the Holy Spirit. This is the indelible seal, the unction that remains and that will help man during the course of his life to choose to follow Jesus Christ throughout every test that he will have to face into. The Holy Spirit, already received at the moment of conception, unveils the image of God that he carries within himself to the soul. It encloses the identity of every man, the fact that he is the son of God. In this way the soul understands its originality in God, which it will express in being and acting”. Father Tomislav: We are not speaking about Jesus of Nazareth as a historical figure; we are speaking about the Word of God, who is eternal, with the Father. When the soul encounters God in spirit, it encounters the Most Holy Trinity. Jesus Christ is the perfect image of man. Right here we can understand the freedom of man and the goodness of God and the Son of God, Jesus Christ, ready to rescue man when he fails, when he sins. At the same time, every one who chooses Jesus Christ at the moment of conception will be directed towards Jesus Christ and begin to work like Jesus Christ. In the same way as Jesus Christ lives for the whole of humanity, for all creatures, with the desire to reunite them with Himself and take them to the Father, every man who follows Jesus Christ participates in His mission. You see, this is the foundation of the recapitulation in Christ already marked out at the moment of our conception, which also determines the basis of our life, our direction and our responsibility. Let us listen to what St. Paul says about his the experience. Father Tomislav: Now we raise the question of how we can practically immerse ourselves in the Spirit of God. We have taken this passage of St. Paul to see in him an example. He is in prison, suffering, but he is immersed in the Holy Spirit; he is immersed in the Trinitarian relationship, as you have noticed in this passage, and he surpasses weakness, calls us to be proud about our weakness. In another point he prides himself of his weakness, for through his weakness the power of God manifests itself. If we look closely, we notice that St. Paul says that in prison he is on his knees, but why is he on his knees? Because he is carrying out his mission to convey the truth, the life, to the faithful of Ephesus and also to us. Read carefully: his soul, his spirit, is travelling the universe, beyond the borders of any logic, beyond the limit of any human wish or human power. We see a man who emerges from the Most Holy Trinity, who comes out with his soul and all its powers and with his body offering himself totally for the people of God; he offers himself with Christ. What is then the important point for us? All our being must be immersed in the Holy Spirit through our soul so that we can experience His fruit, His virtues and His power as we are submitted to the will of the Father by means of the Son in the Holy Spirit, and this will lead us to a spiritually blameless life. 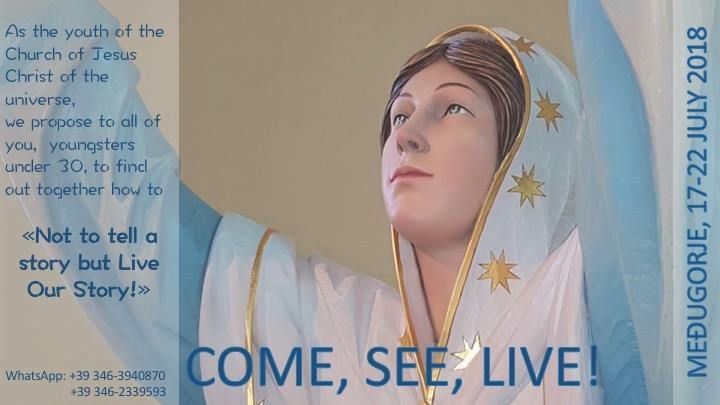 The Queen of Peace – those who have been to Medjugorje will remember it well – has invited the parishioners since 1984 to gather every Thursday before the Blessed Sacrament to read Matthew 6:24-34, the abandonment to God: “Seek first his kingdom and his righteousness, and all these things will be given to you as well,“ and this is what I tell you too with simplicity. 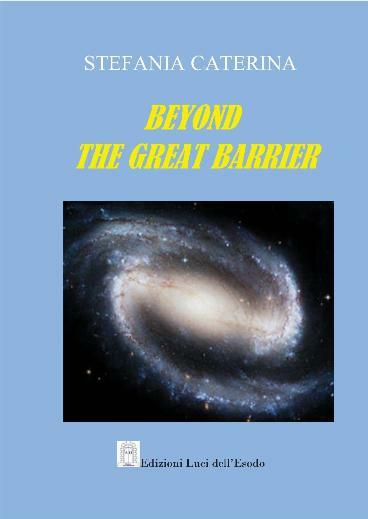 In the book “Beyond the Great Barrier” in the message of St. Joseph – this is the time of the novena to St. Joseph – he speaks about the virginal silence: when a soul is immersed in God, it becomes silent and listens to the voice of God, that mysterious voice that the faithful soul to God will hears in its conscience, in its most intimate place, in its deepest place; if it opens up powerfully it will be reborn powerfully and elevated to God. I hope, we all hope, that you might proceed on your path and experience all this because otherwise all this remains theory. What you will experience within you, will lead you to the eternal truth, for deep inside, in our spirit we encounter the Father, the Son and the Holy Spirit; even though God is transcendent, He is present in us in the way He descended in the temple of Jerusalem, and in the way He descended at Pentecost. I bless you; may the Trinitarian power descend on you, act in you so that all children of God who have welcomed Jesus Christ at the moment of conception may discover the immense grace that comes through Him, and understand that only through Him one can enter the Spirit of God and be elevated to God the Father; in the name of the Father, of the Son and of the Holy Spirit. ”Riscrivere la storia – vol.I – Nel pensiero di Dio“, Publisher Luci dell’Esodo (Rewriting History – Vol. I – In the Mind of God) available in Italian.